Look around Manchester today, and you can still see work by famous architects of the past. Their work continues to be useful, and their buildings, despite the wear and tear of the years, still display beauty and character, along with features whose cost today would be prohibitive. Platt's mother, Mary Elizabeth Cheney (1829-1908) was the daughter of George Wells Cheney, of the founding generation of the Cheney silk mills. She married John Henry Platt of New York, in 1858. 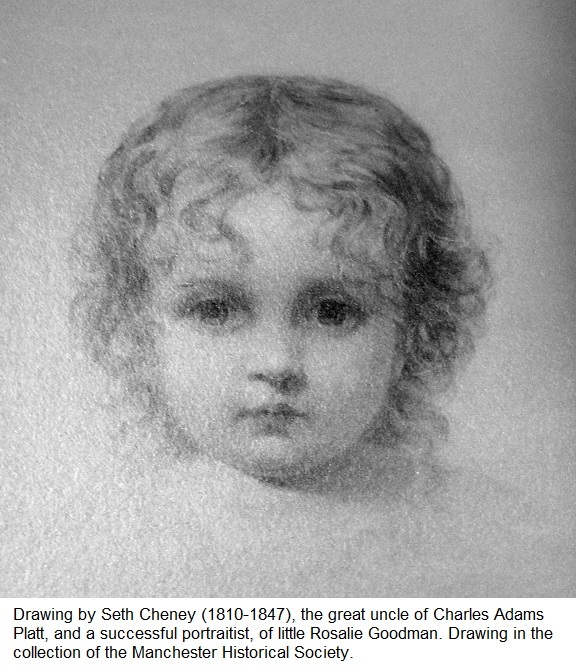 The family lived in New York but came to visit their Cheney family in Manchester. Platt started his fine-arts career in etching, a medium which experienced a popular revival in the 1880s, as owners of even modest homes could purchase etchings of distant and exotic places. 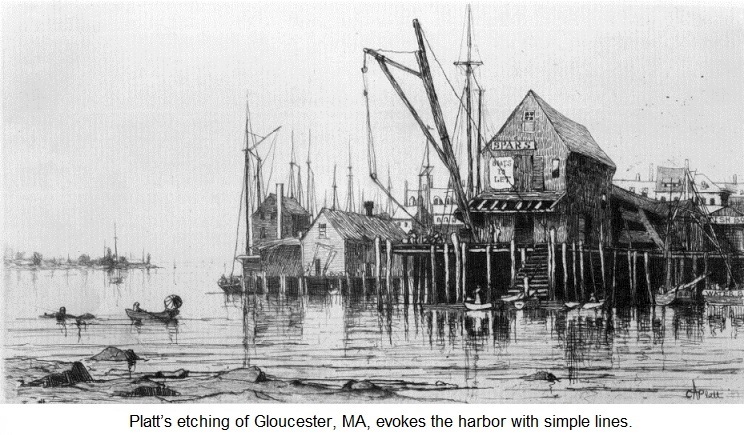 Platt studied with Stephen Parrish in Gloucester, Massachusetts, and produced hundreds of etchings, achieving financial success at an early age. His etchings, like the portraits created by his great uncles Seth and John Cheney, use simple and understated lines to create images with depth and atmosphere. Platt moved to Paris in 1882, and worked on his own for two years before starting to study art at the Académie Julian. He traveled extensively in Italy, and took a great interest in the country villas there, with their columned mansions, terraced gardens, and outdoor sculpture. He had already begun designing American country houses and gardens himself, and in an 1892 trip with his brother William (who was studying at the landscape firm of Frederick Law Olmsted), he visited and recorded Italian villas with drawings, etchings, and glass-plate photography. His images and text appeared in "Italian Gardens," published in 1894. He refers in the book to villas "in the Italian sense, implying all the formal parts of the grounds arranged in direct relation to the house, the house itself being as much a part of it as the garden or the grove. The evident harmony of arrangement between the house and surrounding landscape is what first strikes one in Italian landscape architecture – the design as a whole ... it being clear that no one of these component parts was ever considered independently, the architect of the house being also the architect of the garden and the rest of the villa." In his work in the United States for rich clients, he used this ethic of designing everything, including interior furnishings, to create a wholeness of design. As an example, for the Philip Cheney mansion on the Great Lawn in Manchester, Platt designed the Italian-style gardens, the large and well-lit mansion, and specified the furniture, carpets, and interior painting. Platt's 1920 renovation of the 1878 clapboard house (designed by Stanford White) was so extensive that all that remained of the original was the living room. After the deaths of Philip (1878-1948) and his wife, Helen (1879-1962), this house was not kept up at the level needed for such a grand house. Recently, however, it has been under major renovation by the Viscogliosi family, including fixing the slate roof, restoring the original windows, gardens, and interior floors, paneling, and mural. The Frank Cheney, Jr., mansion at 20 Hartford Road, is now owned by the South Methodist Church and the location of the Greater Manchester Chamber of Commerce. Frank Cheney, Jr., engaged Platt to build this brick mansion in 1901, and to add a third floor in 1921. The Clifford Cheney mansion, a relatively modest 5,000-square-foot pink stucco house, was built in 1904 for Clifford and his bride, Alice Elizabeth (Cass) Cheney, who was also his cousin. Alice's father, John Sherwood Cheney, lived in the mansion across Forest Street. The street address for the Clifford Cheney mansion is Forest Street, but the front faces Hartford Road and the Great Lawn. The John Davenport Cheney mansion at 151 Hartford Road was a 1905 Platt design. At 4,000 square feet, it is one of the smallest mansions. In 1942 the Dobkin family moved to this house – they were the first non-Cheney family to live in one of the mansions. Today it is the home of the Alison Gill Lodge, part of the nonprofit Shelter for Women. The Seth Leslie Cheney Mansion at 139 Hartford Road was made over in 1910 with Platt's design. The house started out as a cottage in 1840 and was expanded and remodeled over the years for various Cheney family members. Today it is the Mansion Inn, where paying guests can enjoy bed and breakfast with the hospitality of owner Bruce Hamstra. Platt also designed the granite base of the Dancing Bear fountain in Center Memorial Park, see article on this website at Dancing Bears. The Mary Cheney gardens south of Hartford Road, which Platt designed, are no longer there, but many old-timers still recall visiting this colorful spot. A discussion of this and other Platt sites is available in the "Charles Adams Platt" section of the Cheney Brothers National Historic District Map section of this website, by clicking here. Platt was internationally famous for country houses, including several in Cornish, N.H. – he summered at the artist colony there with Maxfield Parrish and Augustus Saint-Gaudens. A visit to the lovely Saint-Gaudens National Historic Site is worthwhile and can be made as a day trip from Manchester. You can access the website for the Gardens by clicking Saint-Gaudens. Beginning in 1906, Platt received commissions from the estate of Vincent Astor. 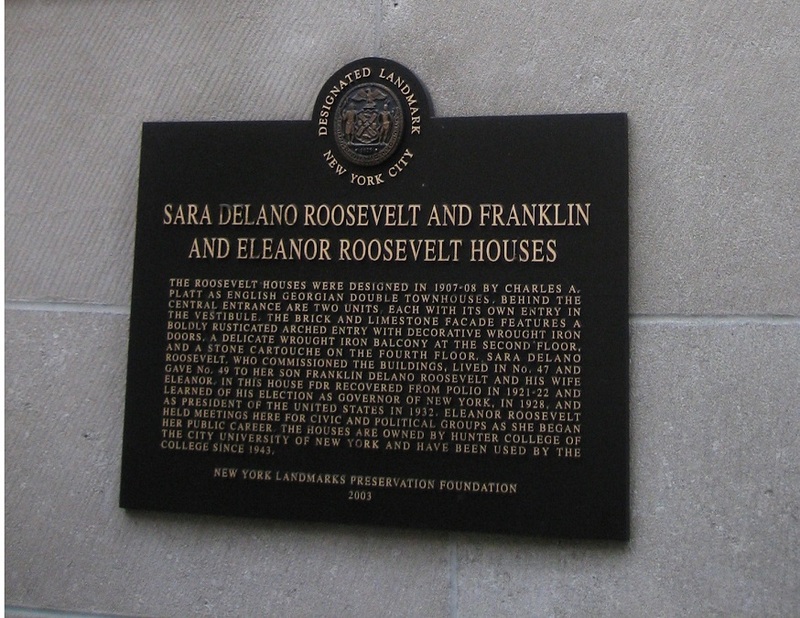 In 1907 he designed a double townhouse for Sara Delano Roosevelt at 47-49 East 65th Street, New York City (now the Roosevelt House, a part of Hunter College of the City University of New York -- see photos of entry and commemorative plaque below right), and in 1912 a grand country estate for Edith Rockefeller McCormick in Lake Forest, Illinois. Other commissions include the Leader-News Building in Cleveland, Ohio (1912), the Smithsonian Institution's Freer Gallery of Art (designed in 1913 and opened in 1923) in Washington, D.C. – the first of Platt's nine museum commissions – and the campuses of the University of Illinois at Urbana-Champaign (1927), Connecticut College in New London, Connecticut, Deerfield Academy, and Phillips Academy in Andover, Massachusetts. Platt designed nine museums throughout the United States, including the Freer Gallery (see above), the Lyman Allyn Art Museum in New London, CT, and the Lyme Association Art Gallery in Old Lyme, CT. He designed residences and landscapes for the rich and famous of his era. 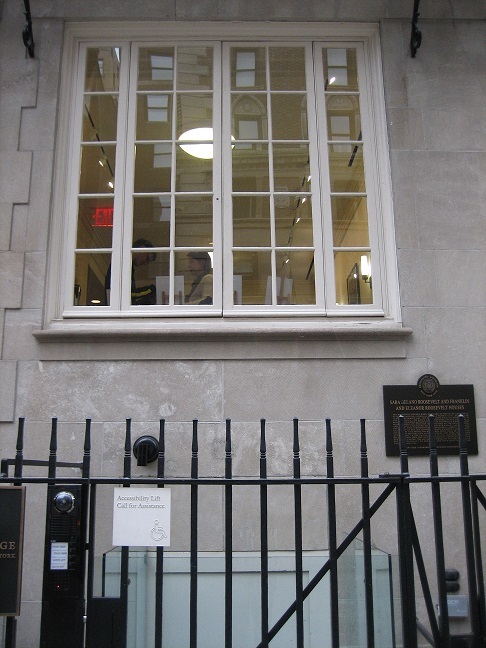 The plaque pictured on the right describes the townhouses that Platt designed for Sara Roosevelt and for Franklin and Eleanor Roosevelt at 47-49 East 65th Street on Manhattan's Upper East Side (now a part of Hunter College). Click each image for a larger view. Hartwell, Richardson & Driver of Boston, successor firm of architect H.H. Richardson (1838-1886), designed the old South Manchester High School, at the south end of Downtown Main Street. It now serves as the Bennet Apartments, but you can still see the original design, which included massive windows, a slate roof, and interior wood paneling. The Richardson firm also designed the seven-story "Richardson Building" in Hartford, built by the Cheney brothers. Other commissions were for the massive Trinity Church in Boston, Albany's City Hall, Harvard University's Sever Hall, and the New York State Capitol in Albany. Richardson designed a house for James Woodbridge Cheney, but a more modest mansion was built instead, a rambling home along St. James Street near Main Street that burned in the 1940s. Artist and architect Charles Howland Hammatt Billings (1818-1874) designed Cheney Hall, 177 Hartford Road, built by the Cheney brothers and dedicated in 1867 as a community cultural center and theater. This grand building fell upon hard times in the 1970s and 1980s, but was carefully restored, and reopened in 1991. Cheney Hall's style is French Second Empire with a mansard roof, brick and brownstone arches, carved oak and chestnut trim and an 1866 E. & G. G. Hook tracker organ built into the rear wall of the stage. Billings designed the mansard-roofed Frank and Susan Cheney mansion on Hartford Road, now owned by the South Methodist Church and used [webmaster note: through approximately January 2013] by New Hope Manor, a nonprofit organization providing education, counseling, and residential treatment. Billings also designed a Gothic mansion for Cheney mill founder and President Ward Cheney in 1869. It was extensively remodeled in 1913, as were many of the mansions during the early 20th century. The stucco-and-half-timbered remodeling, for Charles Cheney, was designed by Hartford architect A. Raymond Ellis, the influential architectural editor of Woman's Home Companion magazine in the 1920s and 1930s. Educational Square, our current Bennet Academy on Main Street, was designed by Carrère and Hastings, a firm established by John Carrère and Thomas Hastings in 1886, when they both left McKim, Mead, and White. In addition to the immense New York Public Library, Carrère and Hastings designed the Frick building on Fifth Avenue in New York City – an art museum housed in the former mansion of industrialist Henry Clay Frick. And speaking of McKim, Mead, and White, the flamboyant Stanford White (1853–1906) of that firm is credited with the design or renovation of three mansions in Manchester: the Rush Cheney mansion on the south side of Hartford Road, torn down in the 1950s; the Rogers mansion on Prospect Street, torn down in the 1970s when I-384 was being built; and the former Knight Dexter Cheney house mentioned above, redesigned in 1920 by Platt as the Philip Cheney house. Frank Cheney Farley (1880-1973), grandson of Frank Cheney of the founding generation of the silk mill dynasty, designed the Mary Cheney Library (he was the nephew of Mary Cheney), Manchester's town hall, Nathan Hale and Washington schools. Manchester is fortunate to have so many examples of the work of historic architects. Still, we need to pay attention to our legacy or we will lose pieces of it – as we have already. The Wickham mansion, for example, was torn down in 1964 purportedly because it would cost too much to keep it up. The John Olds house on Tolland Turnpike is deteriorating more by the day, because the current owner isn't maintaining it. As residents, we can be proud of our legacy, but we also need to be aware of changes that can affect our historic places. And it's not just demolition we need to watch out for. As Charles Adams Platt said in "Italian Gardens" in 1894: "The gardens existing today have all passed through a variety of changes. Some of them have gone almost to ruin through neglect or difference of taste in their owners, and ... those which are at present the most carefully kept up have suffered the most severely from the changing fashion of the time."